Left and Write: 3 Ups Blog Hop! While this is "technically" a blog hop, it's not your typical blog hop. Randi Lee, over at The Emotional Process of Writing a Novel (say that three times fast...I dare ya! ), came up with this great idea to help 'community build' while giving everyone a chance to find some new and different blogs. "Over the next week or two (depending on how much interest I get) I’d like to generate a list of people who want to participate. Once this list is at a good number we’ll get started. The way it will work is like this: each blogger will pick the blogger listed below them, visit his or her site, read a post or two, and then tell them three things they like about the person or his or her blog. Easy enough, right?" Yep...easy enough! Checking the list, today, I saw my 3 Up partner was M.J. Joachim. I've been following a couple of M.J.'s blogs, for a while now, so this won't be difficult at all. In fact, the most difficult thing will be limiting myself to saying only three nice things about her and her blog. 1 UP! Extremely Interesting Blog Achievement: Unlocked! I've said this before, in other posts, but the whole reason I got into blogging in the first place was that I really enjoyed reading about people's lives. Why this is, I don't know, but I just find it very interesting to hear about the ups and downs people go through. For me, M.J.'s blog is one of the most interesting out there. Her topics always hook me in and I can always relate. Her writing style flows well and is very conversational...something that's always a plus with me. 2 UP! Passionate Soul Achievement: Unlocked! Just read one of M.J.'s posts and you can see that she pours her soul into each and every one of them. It's this kind of passion for, not only writing, but living that's also a huge draw. Never preachy, but always thought provoking. 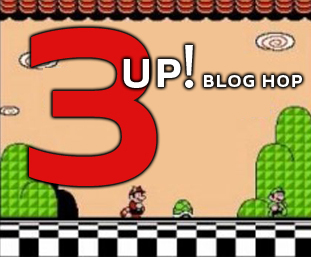 3 UP! Great Looking Blog Achievement: Unlocked! This should be a given on any blog out there but, unfortunately, it's not always the case. M.J.'s blog, though, looks great. The background is crisp and clear, her text and background color don't clash (believe it or not, I've seen some very hard to read blogs out there) and her columns are well organized and not cluttered. Overall, it's just a nice site to navigate and that's something I always appreciate in a blog. A big 'thank you' to Randi for hosting this little hop and, if you'd like to see the list of folks involved, check it out HERE. She does put passion and soul into every single post! I enjoy her posts very much as well. That does sound like an interesting blog hop. Joachim's blog is new to me so thanks for sharing. I knew JM is a great, multi talented gal! loved your video game style presentation! sounds like a great hop! Lol, love the Achievements. This sounds cool, if I wasn't in the writing cave at the moment I might try it out. Also M.J. does have a great blog I agree. I'm not sure I'm following her but it sounds like I should be. What a cool idea for a blog hop! I'll go check out her blog. Thanks for sharing! I think I ought to take a look at her blog. great reading. You sold me. I'm going to check it out. Very well done! I love the achievement unlocked parts. Gonna go check her out. Great idea! Nice comments about M.J. Okay, I'll go check it out. Thanks for the heads up, Mark! You've really pumped her up Mark. I have to see what she's about now. Awesome Mark, and Hello to M.J. Joachim! Oh thank you so much for mentioning 3 Ups in such a positive manner on your blog, I GREATLY appreciate it! And I love your Ups and completely agree with them. Saw in your comments that some people want to see what she's all about...which is awesome and part of what this hop is all about! Again, thanks so much, and thanks for contributing!! @M.J: Sorry to hear you've been having a rough month, but I'm glad I could make it a little better. Besides, I was just telling the truth! I hope things get better for you, soon. @Tara: Thank you and the best thing is that it's simple, yet still great for helping build the community. @Brandon: Thanks and best of luck with your writing! @Shalle: Glad to spread the word! @John: You're welcome and I hope you enjoy! @Randi: Glad to help spread the word and thanks for the great idea! Nice to see so many cool comments here, Mark:) Thanks for such a positive review! I'm looking forward to getting to know all of you and hope we become great blogging friends. Random interruption - some of you stopped by my blog during a little "experiment" using G+ comments. Suffice to say, it didn't work very well, and I reverted to traditional blogger comments. If you left a G+ comment, it disappeared. So sorry for that, but if you read my latest post, you'll understand why. Google needs to work out some things on their end before I make the switch. My blog visitors are the best, so I'll stick with what works best for them. Whew! What a week it has been...looks like May might well end on a high note too:) Best to all! Sold! I'll head over right now. This is a cool idea. I'm popping over to M.J.'s now! It sounds like you had fun with this blog hop, I think it is a cool idea. And I am going to check out her blog, because it sounds wonderful! I feel kind of lost with what you're doing, but it sounds very positive and I'm all for that. M.J. is a wonderful blogger and with something like 5 blogs! She was a huge help during the A to Z Challenge. @Jack: Thanks and, yes, it's a great blog! MJ definitely puts soul and passion into her posts. She's an amazing writer! I enjoy reading about other people's life too. I prefer it to blogs that just slap a blurb up. And while I enjoy the occasional piece of writing, I much prefer blogs about what's going on in your life. What you're facing, dealing with, or solved and how. I'll have to look this blogfest over. My June and July is pretty booked. I'll see if I can squeeze it in. Maybe on one of my Mondays. @M.J: Thank you very much! Those are great comments about M.J.'s blog. She's a wonderful person. I've been reading her posts for quite some time, and I always enjoy reading what she has to say! I didn't need to do this blog hop to follow you! I'm already a fan. Thanks for your Memorial Day post. Perfect. And your healthy blog hop. I LOVE juicing, and eating healthily. Great idea! Thanks for your words, again, for my Dad. You're the best!